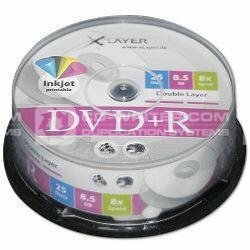 The DVD+R DL (Double Layer) from Xlayer offers a capacity of 8.5 GB. This is achieved by 2 separate recording layers on one single side of the DVD+R DL. This item is sold in 4X 25 pack quantities. If you order this product you will receive 100 units. In testing this disc has performed well at 8X meaning you can copy 8.5GB in under 15 minutes. Highly compatable with DVD players and Video Games consoles like Xbox. XLAYER . PRINTABLE . 8.5GB . DUAL . LAYER . DL . 8x . DVD+R . X . 100 . Xlayer .